Just listed: This beautiful used 48' Sea Ray Sundancer for sale! : Atlantic Yacht & Ship, Inc.
Just listed: This beautiful used 48′ Sea Ray Sundancer for sale! Dennis Rhodes brings word that he has listed a deal on a beautiful used 48′ Sea Ray Sundancer for sale! In the first place, this lightly used 48′ Sea Ray has very low hours. Not to mention this is the type of boat one needs to see to believe. Altogether, this well-made, good-looking hardtop cruiser sets an industry standard. As can be seen by the sweeping lines and bold style. Furthermore, she is built on a Deep-V hull which gives her a superior ride when compared to others. After all, the fiberglass hardtop on this used 48′ Sea Ray yacht insures that all are comfortable. Moreover, with her outdoor air conditioning all are riding in dry, cool comfort. The interior is a gorgeous two-stateroom layout with deep cherry cabinet work. Additionally, with ultra-leather seating, hardwood floors, and designer galley appliances this yacht will not disappoint. You will love the forward (master) cabin as it offers total privacy. There is an additional stateroom aft with twin berths and separate head. A washer / dryer is also provided in that space. 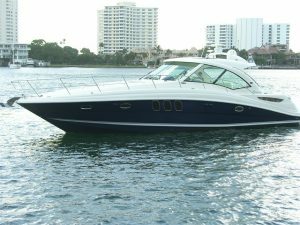 For more information on this beautiful used 48′ Sea Ray yacht for sale contact Dennis Rhodes today! This beautiful used 48′ Sea Ray Sundancer 2005 is seriously for sale! $10,000 price reduction on this beautiful used 48′ Sea Ray Sundancer for sale!